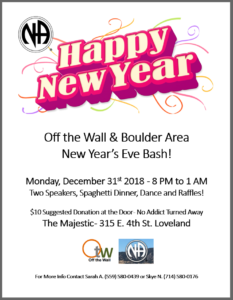 Off the Wall and Boulder Area – New Year’s Eve Bash! Coffee Shop, 544 Cleveland Ave.
Farr Library, 1939 61st Ave.
Updating H&I subcommittee guidelines. 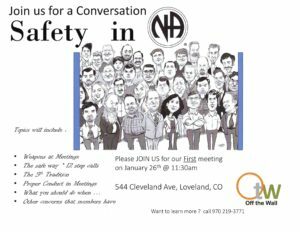 Anyone interested is welcome to attend and participate. 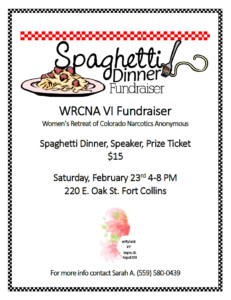 WRCNA VI – Spaghetti Dinner and Speaker Fundraiser! 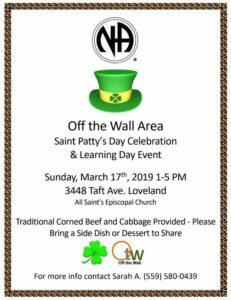 220 E. Oak St, 220 E. Oak St.
Primary Purpose, 929 15th St.
Meet at 929 15th St. in Greeley to caravan or meet at the 6:30 Cheyenne Clean and Free meeting. 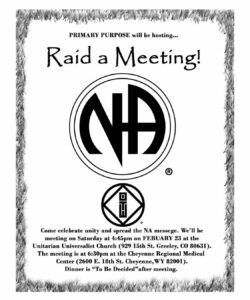 Dinner will be after the meeting at a location to be determined. 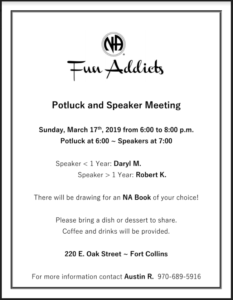 Fun Addicts Potluck and Speaker Meeting! Fun Addicts, 220 E. Oak St. 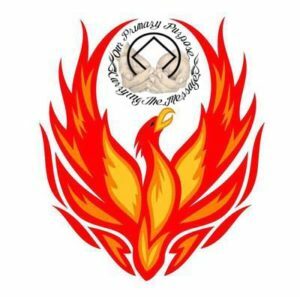 Unity Day, 1660 Sherman St. 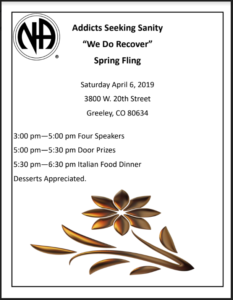 Addicts Seeking Sanity Spring Fling! 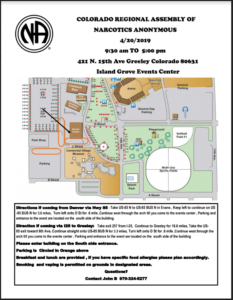 Addicts Seeking Sanity, 3800 W. 20th St.
Island Grove, 421 N. 15th Ave.